What moves me to paint scenes of Georgetown and Sailboats. When I journey through the world I notice natural beauty around me. I notice the way that color and light communicate with one another. When the weather is cooperative I set up an easel and paint Plein Aire style. Other times I capture these moments through photography and go further by composing the image on canvas. While traveling in cities I’m interested in reflections in big picture windows and soft colors on buildings juxtaposed with nature. 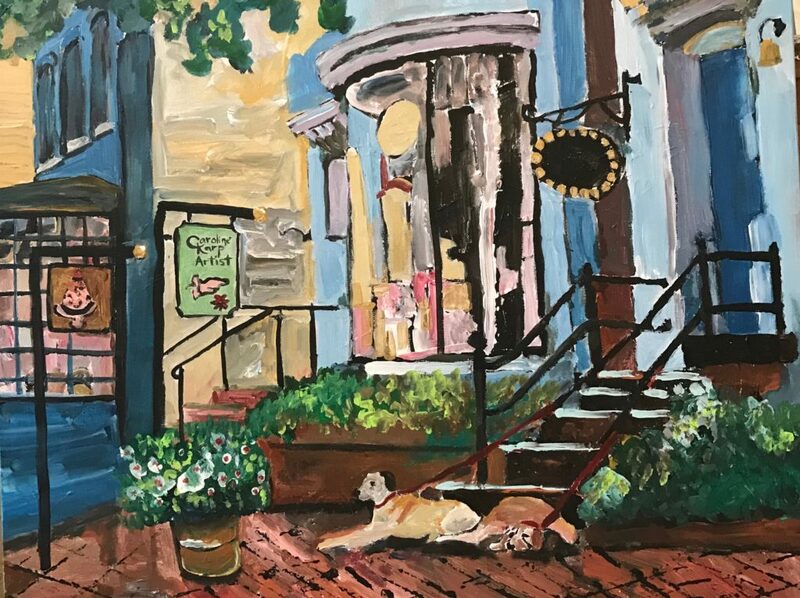 The inspiration behind me painting Georgetown scenes and other “Slice of Life” paintings are observation and discovering what moves my soul. 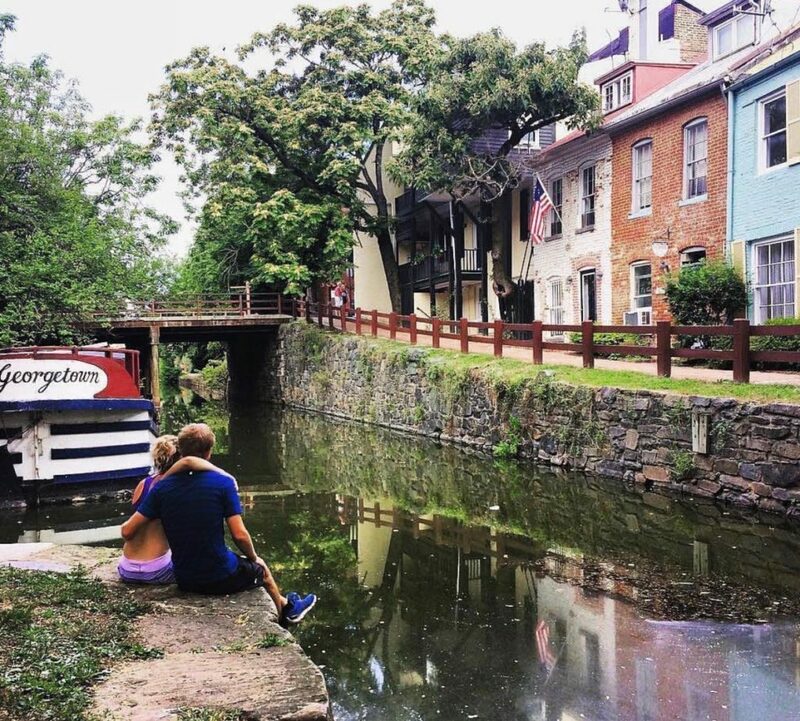 My youngest son is a Sophmore at GU so I travel there often to see him and have fallen in love with the warmth and beauty I find in Georgetown and have always stayed in Airbnbs in the area. It is much different than where I live in Safety Harbor, Florida. There I am inspired by water what nature has to offer there. I’d love for you to know why these three particular scenes moved my soul to paint them. Detail pic to show blocks of color laid next to each other. Notice the name that is painted on the sign. 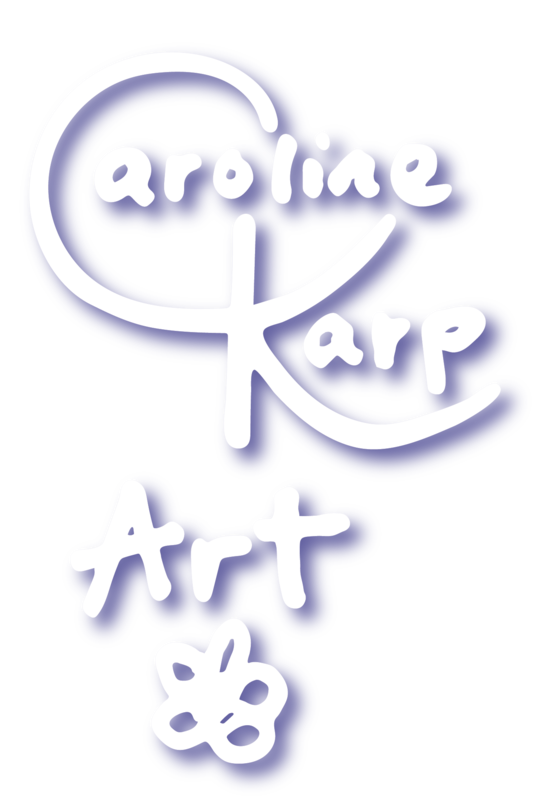 It is there for me to manifest an art studio where I paint, show my work and host retreats. I imagine that every Sunday morning these ladies (not pictured) meet up to walk their dogs and get coffee at this local pastry shop Patisserie Poupon. I saw them on one of these walks and then again later that morning seated here with the dogs resting. It moves my soul because It’s a slice of their life – a moment in time that shows connection, presence, consistency, and commitment. Is’nt that what most of us are striving for? A bit like a Norman Rockwell painting. Detail to show the gesturally paint strokes that depict nature juxtaposed with the man made bridge. As I was walking along the Chesapeake and Ohio canal, I observed the spectacular beauty of nature in the canal even though there was no water and wild growth popping up. I understand that it is sometimes called, “Grand Old Ditch.” I had the vision to show the juxtaposition of nature and the splendid architecture of the overpass crafted by man. I was inspired to paint the story of how moving it was to find this natural spot in the middle of this crazy city with all of its energy. 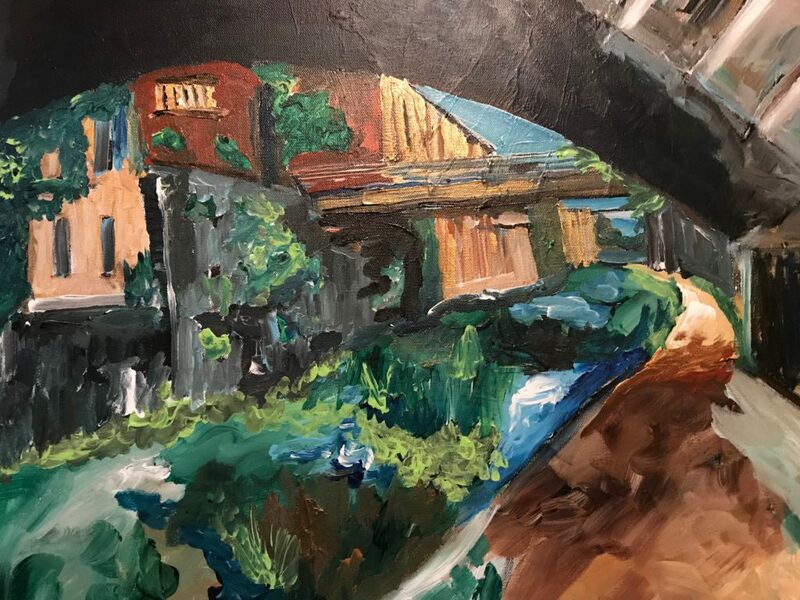 “Look at this beauty, this artistry of nature in the middle of a thriving metropolis.” My wealth is to notice this story of a moment in time and to capture it on canvas. Here is a bit of history of the canal. 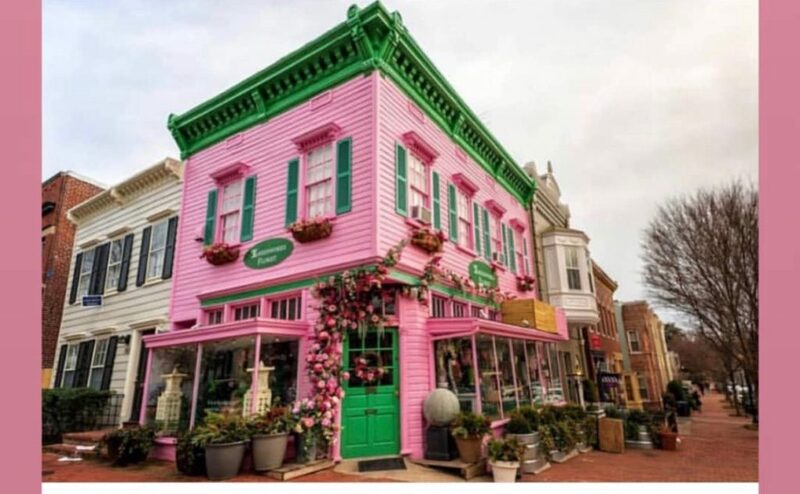 There is just something that is unique and attractive about The Greenworks Florist – Georgetown location. If you are on social media it pops up everywhere and is the backdrop for many photo opportunities. The building , which is painted Pantone Candy Cane Pink, is even more magnificent in person! I was moved to paint an image of it in my expressionistic painterly style that I’m known for. To learn about what moves me to paint water and reflections Read my blog about it cli here. 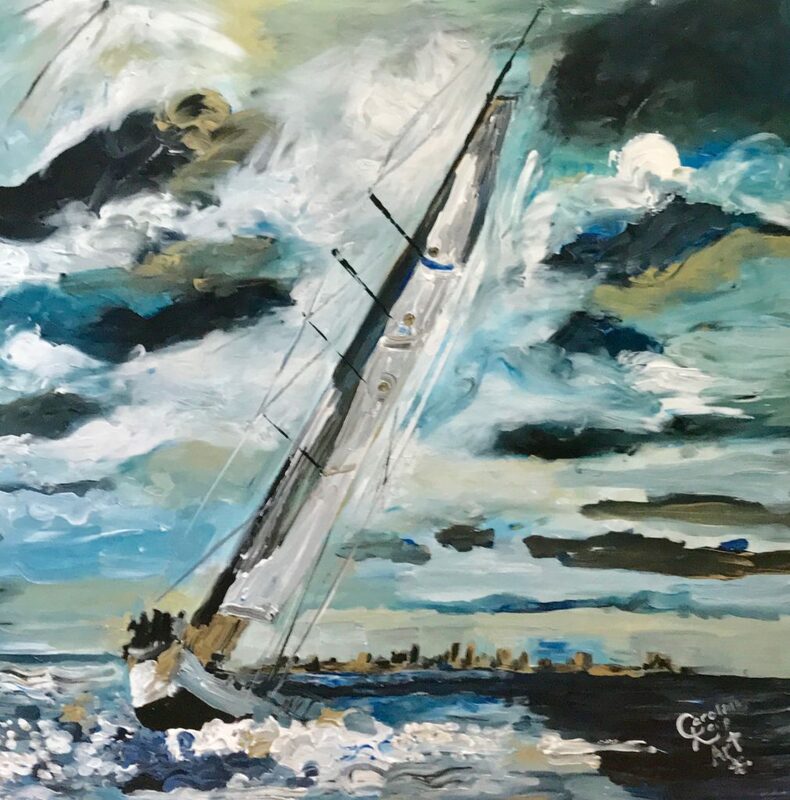 Expressionist painting of a Melges sailboat and its crew in a tumultuous sea.